This unit is located on the "Island", the most desirable area of the Gulf Highland complex, close to the beach and the main pool. You won't need a gulf cart for this convenient location. ASK about our 2018 Special $100 OFF*. *You must make arrangements with the owner to take advantage of this discount offer. With 7 day rental take an additional $100 off of already discounted weekly rental rate for Spring and Fall. REASONABLE PRICE, FAMILY FRIENDLY, CLOSE TO THE BEACH! Just steps to the beach. This end unit is a short 3 minute walk from the front of the resort until you are on the silvery white sands of the Emerald Coast. You will fall in love with this 2 Bedroom, 2 ½ bath updated unit. It has over 1784 sf of total space with over 1425 sf climate controlled. It is comfortably furnished and tastefully decorated with beach décor. Just inside the unit on the first level is a modern ½ bath, a fully equipped kitchen open to the dining room and a living room perfect for entertainment. It is equipped with a tasteful beverage counter located within the living room readily accessible for morning coffee, entertaining or relaxing with your favorite wine, spirit or beverage. A nicely shaded patio is located just off the living room; has space for grilling with the propane gas grill, patio table and chairs and umbrella. This is a relaxing spot after a day at the beach to be mesmerized by the sounds of water and fountains in the canal adjacent to the patio. The kitchen has all new appliances. The dining room has comfortable seating for 6. The living room has a new 60” flat screen TV, a DVR, a fireplace and comfortable seating for family relaxation. On the second level you will find a large bedroom with 2 Queen sized beds, dresser, chest, bed tables and walk-in closet. Adjacent, is a 180 sf deck with patio chairs and table for you to enjoy your morning coffee. En suite is a bathroom with a tub and shower. Also located on the second level is another bedroom with a king size bed and large closet space and flat screen TV. En suite with this bedroom is a bathroom with a stand-up shower. This level also has a modern full size washer and dryer; no worries about sitting and waiting at a public laundromat. WIFI is available throughout the unit. You are only steps away from the front door to the largest pool oasis in the resort complex. Just outside your front door are 2 dedicated parking spots for your convenience. The campus is filled with tropical palms in the courtyard next to the pool. It is only 250 steps to the beach with another private pool and clubhouse that is resort owned and on the beach. The club house has a bathhouse, snack bar, beach showers, and viewing balcony. This unit is located in the front of the resort and close to the beach. 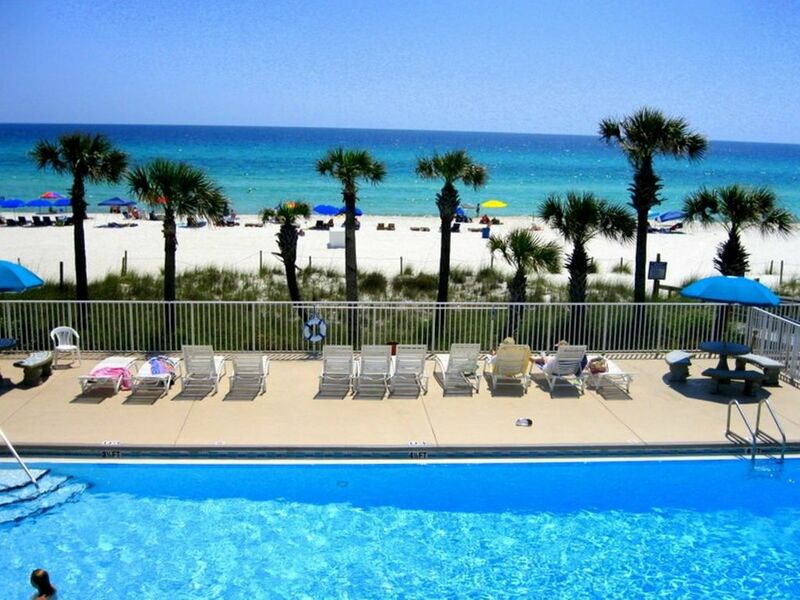 Panama City Beach is known for its 27 miles of blue-green water and white sand. The private stretch of beach At Gulf Highlands is yours to use, and is just steps away. Sunbathe, chase the waves, surf, stand-up paddle board, or build sand castles. Visitors who want a little more beach adventure can go surfing, kayaking, sailing, or paddle boarding. Or, they may choose to head to the pier for some fishing or catch a charter for a chance to see some dolphins in their natural habitat. For a memorable experience, guests can go diving to check out the area's diverse marine life and historic dive sites, which feature several sunken ships. Gulf Highlands is a gated community with security and has amenities galore! This 60 acre resort offers a beach house with a swimming pool, deck, lounge chairs and a snack bar, 11 pools (5 heated), 6 tennis courts (2 lighted), miniature golf, shuffleboard, playground, free broadband WiFi connection at the community center, exercise room, 24-hour security, 2 private parking spaces directly in from of the unit. These amenities are all FREE! The community is known as one of the friendliest resorts in the PCB area. With private beach access guests will be entertained without ever having to leave the property. Located close to Entertainment, Restaurants, Shopping, Theater, Bowling Alley, Arcade, Post Office, Retail and Grocery Shopping; within walking distance from Johnny Rockets Cosmic Bowling, and numerous other fun activities. We are in close proximity to Super Walmart, Carrabba's Italian Grill, Captain Anderson's, BoatYard, Schooner's, and several golf courses, Pineapple Willie's, Spinnaker’s; Ripley's Believe It or Not, Wonder Works Museum, Flowbee Wave Pool, Pier Park, Shipwreck Island, Hooter's. County & City Piers, Baseball and softball park also Holiday golf, The Hombre golf, Signal golf, and Seabreeze Winery. The resort permits a maximum of 6 occupants in a 2 bedroom unit. Families with children are welcome. Reservations for groups of young adult Minimum Age Requirement: - Responsible renters must be at least 25 and must register with our office by submitting photo ID and signing an additional rental agreement. Please note, this age requirement applies to reservations for groups of young adults and does not apply to family groups. Down payment: 33% of the rental is due upon booking. Final payments: your remaining balance must be settled 60 days and then 30 days prior to the date of arrival. Travel insurance: troubles can occur when you least anticipate them, forcing you to cancel or interrupt your trip, lose your vacation investment, and incur unplanned expenses. With this in mind, we suggest that you purchase 3rd party travel insurance. For an about 6.95% you can travel with confidence – even preexisting medical conditions are covered! For additional information on this service, please contact us and we can give you contact information or call CSA travel protection directly. Damage protection plan: instead of having to worry about the hassle of credit card holds, we also offer an alternative of a $59 damage/security deposit protection plan. This one-time fee covers up to $1,500 of accidental damage that may occur to the unit throughout your stay. Marilynn and Mike were born and raised in the Midwest and currently live in St Charles, MO, -metro St Louis. Their love of the ocean takes them there every year. There are no oceans nearby but still if we haven’t been to the beach we haven’t been on a successful vacation. So, it was a no brainer to acquire a beach property within driving distance from St Louis. They want to share their love of the beach with their family, friends and guests. 110 Grand Island in only 6 units from the front of the resort. It is a short 3 minute walk to the beach. It has been fully renovated with new paint inside and out. The floor covering has been replaced and all new appliances in the kitchen. It is newly decorated in modest and comfortable beach décor. You will feel right at home with the fully equipped kitchen, full size washer and dryer, updated bathrooms and comfortable bedrooms with 2 queen beds and 1 king bed. The first floor has a ½ bath for your convenience and the second floor bathrooms are en suite for your privacy. The mostly shaded patio is set directly next to the water features of the canal fountains and provide a serene setting after activities at the beach or pools. Our goal is to provide you and your family/guests with a pleasurable vacation experience and at an affordable price. The Gulf Highlands provides a safe family vacation setting at an affordable price. The amenities offered couples and families are numerous. It is especially nice to have 11 pools to choose from and have some heated in the cooler months. The private clubhouse, pool and showers directly on the beach make the “beach” experience very accommodating. The tennis courts, shuffle board, and miniature gulf are great benefits all at no additional cost. It is located on one of the most beautiful stretch white sandy beaches in the United States and is within reasonable driving distances to much of the US. With a property over 60 acres the walk to the beach could be burdensome. We are fortunate to have a unit located exceptionally close to the front of the property and only 250 steps to the beach. Additionally, Panama City Beach offers the huge number of entertainment sources in the way of restaurants, water parks, amusement parks, ocean activities; such as snorkeling, boating, fishing and parasailing. Gulf Highlands resort maintains a private pool and clubhouse with viewing area directly on the beach. This unit is about 250 steps from the beach. Thank you so much for your review. We have had such great guests this year and we have ended our summer season with another one, YOU. Thanks so much to Mike. We loved the townhouse and the area. The townhouse was so nice and clean, and we had lots and lots of room. The people that live in the area were so nice and welcoming. We will always appreciate this vacation time away from home, which we needed. Thanks to Mike, the owner, for being so courteous and helpful. Hope to be back soon. We had an incredible vacation in this condo! My husband and I took our 4 children. TONS of room! Just a short 300 steps to the beach....we have stayed in highrise condo's before...this beats waiting for elevators, and walking across bridge links to find your car in a parking garage!! The condo was IMMACULATE upon arrival! We had everything we could possibly need! We had 2 teenagers and 2 young children. The main pool is just across the street down a cute pathway. Across the street you have the pool with the ocean view. The food at the diner is AMAZING! Mike was awesome to work with! We will definitely go thru Mike again! Thank you for the very kind words. We appreciate our guests and hope to never disappoint them. Having the unit professionally cleaned is only the first step. Of course the location in the complex is helpful in making it easy to get to the pools and the beach. We will continue to keep our unit up to date and upgrade as we go forward. Thank you again for writing. We had a wonderful vacation in this condo. We are grandparents, daughter, son-in-law and 2 grandchildren ages 6 and 9. Condo was nice, clean and comfortable. Had hours of fun fishing in the canal out back. Short walk to the pool across the street and short walk to the beach. Very nice pool and clubhouse at the beach. We have vacationed at Gulf Highlands for 20+ years. Tried other beaches and always come back to Gulf Highlands. For us this condo has everything we want - fishing in the back, several swimming pools, beach pool, gated security, grandchildren bring bikes, we bring our fur baby (a toy poodle), easy access to middle beach road and all for a good price. We have stayed at several different condos on the island side, but this one is our favorite. Really liked the updates in the bathrooms, new carpet, door locks and side by side ice in the door refrigerator. We will definitely be back to Mike's condo and recommend it to friends and family. He is very easy to work with and does a thorough job. Thanks for a wonderful vacation in your PCB home. Thank you so much for taking the time to write. You were such great guests and so easy to work with and love to see you come back again. The pictures do not do this place justice! Everything was very clean and beautifully decorated. The kitchen has all the necessities. The back patio with the canal is very relaxing. Great shade in the morning and the evening. Location is excellent. Walk to the beach is very easy. We will definitely stay here again! Thanks again for staying at our home. We certainly enjoy when guests have had a wonderful stay. We especially like to work with people who are pleasant and make it easy. Hope to see you again sometime. We rented this unit for the month of March. It was very clean and the beds were very comfortable. It is tastefully decorated and comfortable. More seating in living room might be considered, but overall a very pleasant stay. Mike was very nice to deal with and the neighbors were great! With the new restrictions during March break, the beaches were quiet and more families were vacationing. Gulf Highlands community has amenities galore! This 60 acre resort is a gated community, it offers a beach house with a swimming pool, deck, lounge chairs and a snack bar, 11 pools (5 heated), 6 tennis courts (2 lighted), miniature golf, shuffleboard, playground, free broadband Wi-Fi-connection at the community center, exercise room, 24-hour security, 2 private parking spaces directly in from of the unit. These amenities are all FREE! The community is known as one of the friendliest resorts in the PCB area. With private beach access guests will be entertained without ever having to leave the property. Located close to Entertainment, Restaurants, Shopping, Theater, Bowling Alley, Arcade, Post Office, Retail and Grocery Shopping; within walking distance from Johnny Rockets Cosmic Bowling, and numerous other fun activities. We are in close proximity to Super Walmartne, Carrabba's Italian Grill, Captain Anderson's, BoatYard, Schooner's, and several golf courses, Pineapple Willie's, Spinnaker’s; Ripley's Believe It or Not, Wonder Works Museum, Flowbee Wave Pool, Pier Park, Shipwreck Island, Hooter's. County & City Piers, Baseball and softball park also Holiday golf, The Hombre golf, Signal golf, and Seabreeze Winery.